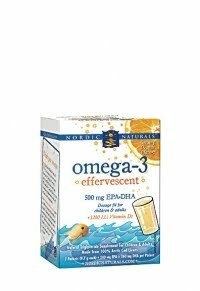 Non-Diet Tips: Ever Heard of a Fizzy Omega 3's Beverage? Ever Heard of a Fizzy Omega 3's Beverage? Omega 3 supplements in the form of fish oil capsules are very common, but it can have that intense fish aroma. This has always been my reservation about fish oil capsules and when I take time I make sure it's as close to bedtime as possible. After having a few capsules "fishy breath" and fish infused belgies abound! Not the ideal situation for a social event or a passionate kiss! How nice would it be to reap all the benefits of Omega 3's from fish oil without the "fishiness". Well new innovations from Nordic Naturals is making this possible. They have developed a new way to take fish oil supplements through a water-soluble, effervescent drink mix in an orange flavor which you add to water. Each packet of the supplement contains 500 mg of EPA and DHA and 1200 IU of Vitamin D. The fish oil used is cod live oil from Arctic cod from the Norwegian Waters. The "fizzy" fish oil solution is also better absorbed more quickly into the bloodstream and is easier on the stomach. According to the company the product is not oily, does not smell or taste fishy. Well that certainly picked my interest enough to put this innovative product on my Wish List. I'm definitely willing to give this one a try. If you want to learn more about the product be sure to check out Nordic Naturals and begin drinking your omegas as their website title says. NOTE: I'm not affiliated with Nordic Naturals in any way, but I feel this innovative idea should be shared. I feel that "healthy" and "good for you" shouldn't make you miserable and certainly should be as appealing as possible taste-wise. Therefore I am more than happy to share a product which seems to accomplish this, gives you options, and helps you accomplish a more enjoyable eating experience.